Each post tends to start the same way. How can we manage our time with incorporating necessary duties AND learning into our schedules. Well, learning a foreign language for many is a daunting task. We have work, exercise, and social activities on our agendas. How the heck do you find time to learn a new language? Because I love the language of Espanol, we will use it as an example. To begin, you need a base of knowledge of that language including knowing 1-3 verb tenses (past, present, and commanding – you begin to pick up others the more you learn and study). If starting from scratch the best way to get that base knowledge is by taking a community college class for 1-2 semesters. It keeps you on track with your progression and forced to study for tests. Once the verb tenses and basic vocabulary is ingrained, maintenance is key for continuing to advance your fluency. Just like any skill, if you don’t practice, you will lose it. I am not fluent in Spanish by any means but I love the ongoing effort to continue learning in a way that does not require a lot of extra time. I went from having a beginners knowledge of Spanish Vocab to intermediate just by listening to Spanish Pod every morning while I was walking the dog. The key to finding a good podcast is length. If you want to integrate it into a day that has no minutes to spare, It must be short. I began with SpanishPod – a daily podcast I found on I Tunes that has multiple levels of difficulty and incorporates real daily conversations into your learning. It was funny, so I was hooked. That went well, until they started charging for intermediate and advanced lessons. There are many other podcasts available on I Tunes to help you get going. This has been most successful for improving my listening skills. I listen to Salsa, Bachata, Reggaeton, Merengue, and Pop latin music. The sound is very similar to English hip/hop and Reggae (two of my favorites styles) meshing to give a nice Caribbean beat. Of course, the vocabulary of most Latin music is about love, fighting, and dancing so it is not the broadest of vocabulary to study. Reggaeton is very similar to English hip hop – fighting, gangs, and derogatory to women but it has a great beat and you can usually pick up the verses after listening a few times. One of my favorite podcasts that plays this style of music is www.corrientelatina.com. The website also has videos, music, and information on entertainment. Immersion is the easiest way to be forced into speaking Spanish for a long period. Mexico, Central America and South America all have affordable options for vacations. Some places I really enjoyed were Cabo San Lucas (Mexico) and Ecuador. I am leaving for a two-week trip to Costa Rica soon so should come back with improved Spanish! In California 1/3 people knows more than beginners level Spanish. I work with people from Honduras, Guatemala and Mexico. Practicing daily will help maintain your vocabulary. Have a “Palabra del dia” (word of the day) to incorporate into your daily conversations with co-workers. Before you know it you will have 365 more Spanish words and phrases to your vocabulary. As I said above, taking Spanish I and II are essential stepping-stones to getting a base knowledge. The other option is listening to Rosetta Stone or other learning series. In my experience, it is easy to fall off the wagon with the listening CDs and they are minimally interactive. They are also more expensive ($200-600) than taking a 70$ community college class. Use it when you are talking to people in your community, your spouse, and friends. They may appreciate the review as well and it will allow you to review your vocabulary daily as I said above. Even if you have a horrible accent, Spanish-speaking people usually like to help you out and appreciate that you are trying. Talk to the clerks at stores, ordering food, and anyone you come into contact with that speaks Spanish. I love what I do for work and have found that the best way to incorporate studying Spanish is to use it while at work. I don’t have many Spanish-speaking patients in the outpatient clinic I work at, but I float into the inpatient hospital in the Mission district, where there are many Spanish-speaking patients. If necessary I use an interpreter, but I usually do well enough. A lot of my Spanish vocabulary consists of body parts, pain, direction giving so I am fairly good in the medical realm, but I couldn’t last a minute in a conversation about politics. If you don’t and opportunity to work in a place like this, find a place to volunteer (Good Will, soup kitchen or a church). This is the fastest way at improving Spanish vocabulary because you are thrown into an environment where you are communicating constantly with patients and community that you are attempting to improve in a short period of time. Missions are a lot of work but are very rewarding. I have the privilege of traveling to Ecuador with Operation Rainbow for 3 years and look forward to it every time. It is unpaid and I donate a whole week of paid time off for the chance to help Ecuadorians improve their health care systems and quality of life. While there I am essentially giving Physical Therapy as I do every day in the US, however I am speaking Spanish the entire time. We have interpreters present if I get stuck but by the end of the week can usually hold a clean conversation in Spanish. 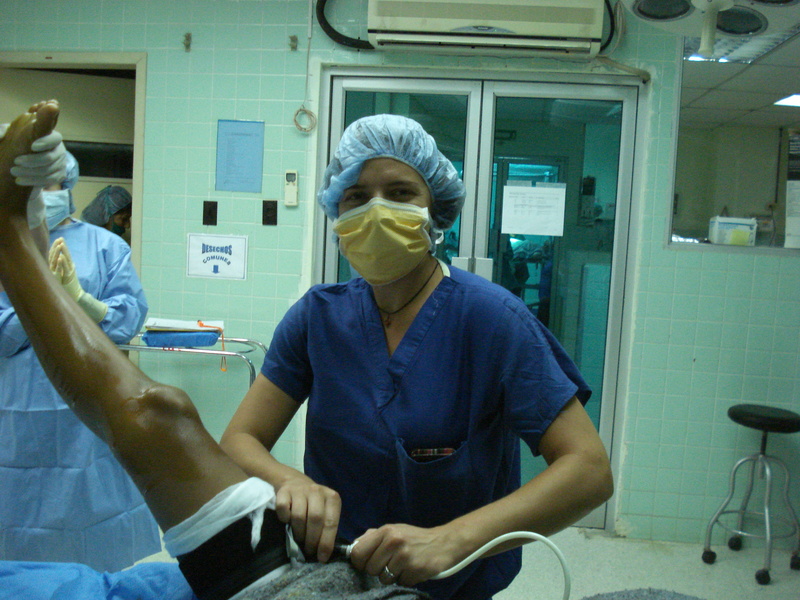 Operation Rainbow mainly goes to Central and South America (Latin America countries) with teams of Doctors, Nurses, Physical Therapists and interpreters but NOW they have a team in Haiti. In the earthquake relief effort, Operation Rainbow would be an excellent organization to give to.